Hundreds of Israeli soccer fans couldn't stomach the sight of a Muslim player scoring for their own team. Israel’s repression of the Palestinian national soccer team, including the imprisonment and assassination of players and the shelling of the team’s office in last fall’s bombing of Gaza, has also stirred not only activists but players and even FIFA to action. In 2010, even UEFA President Michel Platini threatened Israel with expulsion from FIFA if it continued to undermine soccer in Palestine. Platini said, “Israel must choose between allowing Palestinian sport to continue and prosper or be forced to face the consequences for their behaviour.” What maddens people is that by holding the Under-21s in Israel, it actually seems like the country is being rewarded. The great power of sport historically is that it has provided space for marginalized people to find a voice, as well as a setting for all of us to discover our common humanity through play. 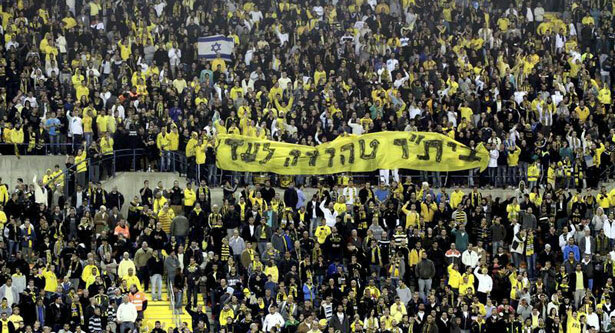 What does it say about Israel in the twenty-first century that a team like Beitar Jerusalem can not only survive but thrive? What does it say that Israel still gets to host the UEFA Under-21 championships despite interfering with Palestinian efforts to field a team? What does it say that sports are now enmeshed in the political conflicts in the region? If nothing else, it tells us that not even sports can provide escape, respite or a safe haven from the pressures of occupation. It also tells us that seeking justice on the playing field and in the soccer stands in Israel is also about seeking justice for the Palestinian people and no cultural arena can be exempt from this process. I know what side Jackie Robinson would be on, and it wouldn’t be with the so-called fans who hate the ethnicity of a player more than they love a goal for their team. What does a Cornell science development have to do with the Israeli occupation? Read Adam Hudson’s take.